Having read Peter's Pearl on Bagpipes ..
.. I have hunted out my recording of Mull of Kintyre. First, a reminder of the salient points mentioned by Peter. 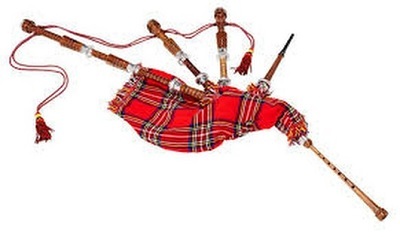 The bagpipes consist of an air supply, a Bag, a Chanter and a Drone (sometimes more than one). The Chanter is the melody pipe, and the Drone just 'drones' on and on. The piper emits a continuous, even sound throughout his rendition. There are no pauses, or rests at all. So don’t allow your fingers to ever be idle. Rather run one note into another. You must get your bass to emulate the sound of the drone .. literally droning on by constantly sounding the same note. Your fingers, however, should never take a breather. On a bagpipe you can't make the same note sound twice, so have to 'skip' elsewhere and come back to the note to hear it sound again. For this reason you have to do something to distinguish between two identical consecutive notes. Here is Peter's music showing how a piper would play those extra 'skipping' notes, or 'grace notes'. I have noticed that in this music there are 'grace notes' between every note of the melody, not just where two notes follow on that are the same. Presumably this is what Peter means by saying, "Your fingers, however, should never take a breather." 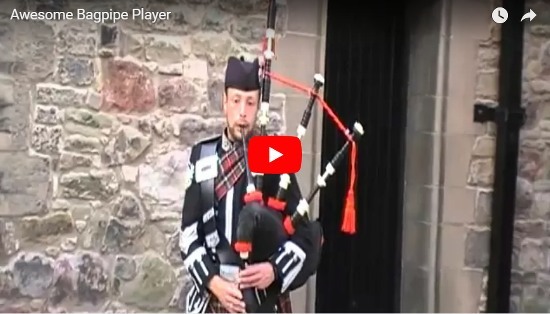 Here is the YouTube video of a Piper playing. When we have the professionals come and play at our organ club, whenever they mention they are going to play 'bagpipes' a groan goes across the room. Can't think why, as I rather like the sound from bagpipes. Creates a 'mood' of Scotland .. Highland Games, and Scottish Country Dancing. One of our Members, Andrew Gilbert has played a short extract for us of Auld Lang Syne on his Roland AT900P organ. I like the way he has used his 'Pitch Bend' to 'wind up' the bagpipes at the beginning of his piece. Doing that makes the bagpipes sound like the real thing! But I have noticed that he hasn't got any 'grace notes' in his playing. Even putting a grace note or two between two melody notes that are the same must be difficult when it is so easy for us playing on a keyboard to actually play two notes that are the same in succession. If you were actually playing a bagpipe you wouldn't have any problem at all as you just couldn't play the note again, and would have to 'skip' somewhere and back to get the same note to re-sound. Whether or not you play a piece with bagpipes depends on whether you are one of those who 'groan' when bagpipes are mentioned. Here is my recording of playing 'bagpipes' on my AR 80 organ (Mull of Kintyre), but I am a 'harmony' person and had multiple drones (? ! ?) so I could choose a bass in harmony with what I was playing. 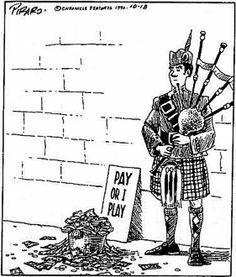 And I didn't take into consideration that with a bagpipe you can't play two notes the same on the trot and have to put in 'grace notes' (I didn't know about this at the time). So not an authentic sounding 'bagpipe'! I followed that with The Road and the Miles to Dundee played on Piano Accordion, another Scottish instrument which is used extensively for Scottish Country Dancing. Click this LINK to listen. You may have to hover over the loudspeaker icon to turn the volume down a bit. I think I'll have another go at Mull of Kintyre, putting some 'grace notes' into the melody on the Chanter now that I know about how this should be done. Here's a DEMO sent by Charles Hughes of him playing bagpipes on his AR 80 organ. He's got all the 'grace notes' there in his recording. A short interlude now. Take your partners for some Scottish Country Dancing. Piano Accordion & Piano .. no Bagpipes. I have had another go at playing those bagpipes, making sure I put in those 'grace notes' whenever there are two notes on the trot that are the same. And for good measure, as this is what bagpipes seem to do, I have skipped about and added a few more notes here and there. The above played with a more 'authentic' bagpipe? It's also worth mentioning the key change. The first tune I played in G. The second tune I play in F .. but how to get from G to F? G to F also gives the musical effect of 'falling'. It's better to have the music 'rising', so I have inserted the chords Bb and C7 between the two keys. This seems to have the desired effect of the music 'rising'. 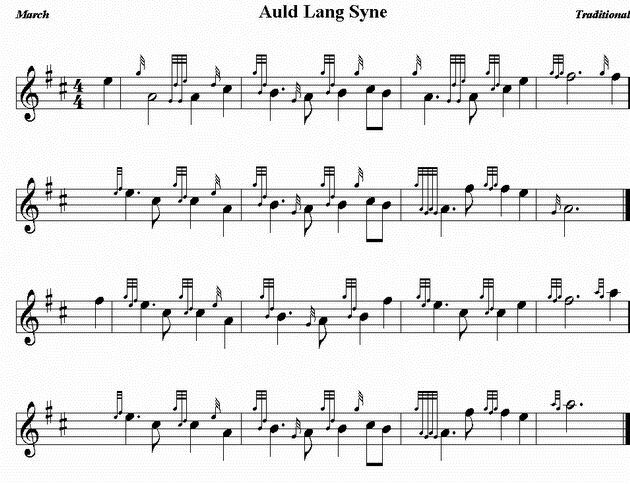 In bagpipe music there is extensive use of grace notes. Indeed, because the chanter is not tongued but supplied by a continuous air source from the bag, grace notes are sometimes the only way to differentiate between notes. For example, inserting a grace note between two crotchets (quarter notes) played at the same pitch is the only way to indicate them as opposed to them sounding like a single minim (half note). Various multiple grace note ornaments are formalised into distinct types, such as doublings, throws, and birls. A single grace note is played on the beat as is the first grace note of a complex ornament such as a doubling. The ornament taorluath is an exception: its last grace note is played on the beat. Gracenotes are typically played as short as possible by lifting the fingers quickly and a short distance off the chanter.